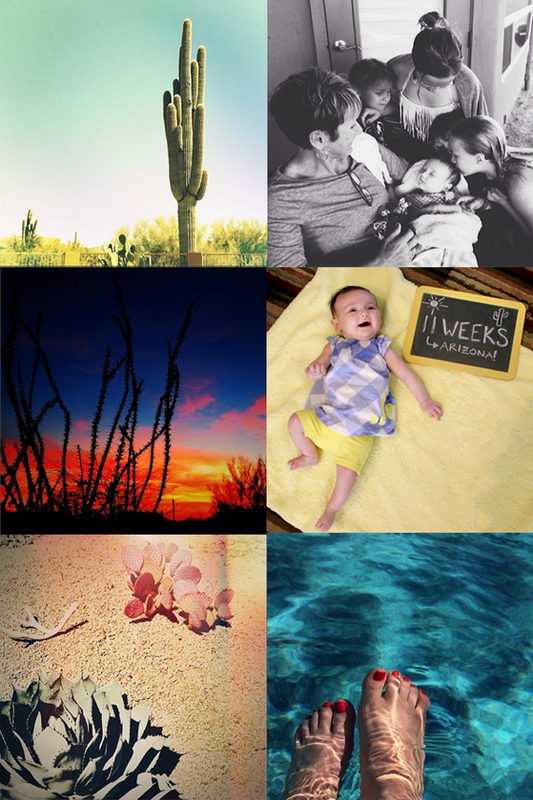 Bubby and Bean ::: Living Creatively: Hey from Arizona! Essley and I have been having such a nice time relaxing here in Scottsdale. The weather has been absolutely incredible, and we've spent a lot of time just hanging out outside, doing very little. It's really the first time since she was born that I feel like I've been able to just enjoy being Essley's mom. I started working again two weeks after giving birth, and for the past two months, we've been in the midst of Robbie's busiest time of the year on the road with the band. So it's been a nonstop juggling of work and taking care of Essley (mostly by myself) for a while now, with no down time at all. Being able to take a little time away from working and also have help with Ess (we're staying at her grandparents' house) has felt like the greatest luxury. The band plays in Tempe on Saturday and then Robbie will stay here with us for a few days before we head home, which will be so wonderful. His birthday is tomorrow and I can't wait to reunite (it's been two weeks since we've seen him) and celebrate in the Arizona sunshine. For those who have asked, Essley did surprisingly well on her very first flight. The passengers around us seemed to genuinely appreciate the goodie bags, and at the end of the flight, many of them even remarked on how good she was. She had a couple of brief crying episodes and blew out a diaper, but it was an infinitely easier experience that I thought it would be. Phew! We were also greeted at the airport by all of Essley's cousins from Austin who had been here visiting on their spring break but were scheduled to leave the day before. It was a pretty amazing surprise! I felt so lucky that they were able to meet Essley and that we were able to spend a day with them before they headed back. I've been posting lots of pictures from our trip over on my Instagram (user name bubbyandbean) and will continue to do so, so follow us over there if you'd like to keep updated on our adventures. What a happy little baby! Glad the flight went well! Wish we had weather like that over here! I'm glad her first flight went well! Enjoy your trip!!! so glad she did well on her first flight , thats awesome! looks like you're having a blast! Enjoy your little respite. Great pictures. Essley is such a cutie. Cousins and grandma seem to think so, too! Glad the flight went pretty well. Love the pictures! It sounds like such a nice trip. So glad to hear you having such a great time, and it's always good to visit family. Love that shot of Essley with the family around her. Precious.